It has taken me most of my adult life to learn how to enjoy my lunch hour during the work day. I know, it sounds crazy. But I think I’ve spent all my working years with thoughts racing through my head about projects or problems and I could not figure out how to turn them off during the lunch hour. That has changed. Now I sit in the sun. I read. I let my mind wander to Italy. Right now I’m reading book called “Italy, A Love Story” – a wonderful collection of essays where women write about their Italian experience. Each story is personal and moving and nothing ever turns out as expected. A woman hoping to reunite with her lover, dumps him in favor of spending time on the sofa watching television with his mom and listening to her stories. Others go in hopes of eating a local sea urchin delicacy only to find themselves drawn to the immense historical context of the area that they failed in their search to find the urchins. 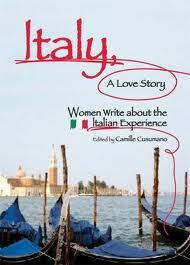 As I read these stories I can’t help but wonder what unexpected turn my trip to Italy will take. ← It’s all about the language…..